The Sloty Casino site was established in 2017. The business is owned and run by the Genesis Global Limited Casinos. We are going to analyse them and prepare a well-though Sloty Casino review for you. They have obtained licenses from the big three authorities of the online gambling industry. They offer their customers a wide range of games, both popular and new. The site has quickly drawn attention because of their games selection, which comes from a variety of well-known software providers such as NetEnt, Microgaming, Quickspin, Nyx Gaming and Play N’ GO. The site has a nice and user-friendly interface that follows a minimal theme. The theme is based on blue and white colour palates. The site runs on instant play so there is no need to download anything. Also, the mobile site is pretty decent and runs smoothly on any smartphone devices. You can find more about the Sloty mobile site later on in our Sloty Casino review. To abide by the rules, Sloty Casino has to restrict some countries from their list. Restricted countries include France, Spain, Iran, Italy, Turkey, North Korea, Portugal, Denmark, USA, and others. You can find the full list from the Sloty site. Sloty: City of Slots. Why Them? The Sloty Casino has a good reputation among the frequent online casino players. Here are some of the features that make this casino worthwhile. The Sloty Casino site uses all the renowned names associated with the online gaming industry. Software suppliers like NetEnt, Microgaming, Play N’ GO, Nyx Gaming, Quickspin, Lucky Streak and others are part of their gaming providers list. The site runs on the instant play program, so you don’t have to download anything to play the games on any site you choose, be it your PC or mobile device. The games are nicely presented in a grid of logos, from there you can see the categories in terms of types, software provider etc. One minor downside here is that you can only see 20 games’ logos at once. This was perhaps done to make the site more responsive. Once you scroll down the 20 games, you can load the other games and select from there. The manual loading option does speed up the loading time though. The good thing about the Sloty casino site is its ability to scale to any ratio. The software will scale either up or down based on the browser you choose. The mobile site also scales down via the software’s automatic detection system. This helps in navigating the mobile site very easily. Sloty Casino site, in general, looks like all the leading online casino sites. The top of the page has a menu button where you can find options such as games, settings and payment options. The games menu will show the available option. From here you can choose to either play with real money or just practice play. eWallats pay out cash almost instantly. Mobile site and instant play. The live casino has a good range of games. Not available in multiple countries. Welcome bonus not open to all users. Some of the nice things about the overall interface of the Sloty Casino site which are worth mentioning are the quick jump button and the developer tags. The quick jump button is used to take you directly to the games menu, no matter where you are currently on the site. You can find a purple button on the bottom of the site labeled ‘Fly into Games’. This is the quick jump button. It is very useful when you need to get to a game quickly. There are developer tags on each game box’s top right side. The tag says which software provider has created that particular game. So if you are a loyal fanboy for a particular developer, this will come handy for you. Slots are, you guessed it, the main attraction of the Sloty Casino site, hence the name. There are more than 1200 slots games available on the site. They offer free to play options in many of these games. But to win real cash or prizes, you need to spend £0.01 for each spin. Popular slots such as Mega Moolah, Moon Princess and Wins of Fortune, among others, are part of the Sloty Casino’s portfolio. Other than slots, the Sloty Casino site does have a good range of table games. The table games are what give an online casino a good base, as no brick-and-mortar casinos are complete without them. Table games make an online casino site complete, and the Sloty Casino site has a good range of games in this category. The table games include Blackjack, Roulette, Baccarat, and Poker in classics as well as many variations. The Sloty Casino site has a good range of video poker games on the site as well. The video poker games have a different tab in the games section. They have some multi-hand options here if you want to see the multiple deals at once. Some variations of video poker on the Sloty Casino site include Aces and Faces, Aces and Eights, Tens or Better, Jacks or Better. Joker Poker, Bonus Poker, Jackpot Poker, Deuces Wild, Deuces and Joker and many others. Chances are, you will find something you like if you spend enough time on this section of the site. It is a good sign when a casino realizes that not everyone is looking to become a gambler. Or perhaps some gamblers are looking for other options to not become bored with the casino games. This is why the Sloty Casino site has some specialty games. These games are for everyone, and gamblers and non-gamblers alike would love to play here. These games, most of the time, don’t have a need to show many skills. But the good thing is that you can still win it big. Some games of such caliber from the Sloty Casino site are Monkey Keno, Hole in One, Triple Chance Hilo, Bugs Party, Scratch Ahoy, Super Wheel, Germinator, Mayan Bingo, Flying Pigs and others. These games are a great option for stress relief. The Sloty Casino has a very generous welcome bonus for their newly registered users. The welcome bonus includes a combination of cash and free spins. The welcome bonus offer is spread through the first 4 deposits you make after just signing up. The first deposit will get you a 100% match up for up to £300 with 300 free spins. The 2nd to 4th deposits will match up to £400 each, with 50%, 25% and 25% match up respectively for the 2nd, 3rd, and 4th deposits. The minimum deposit for this bonus to activate is £10 for each of the first 4 deposits. The wagering requirement is 40X for the deposit and 40X for the free spins. The maximum bet you are allowed to make is £5 for each round. The winnings from the spins have a maximum cash out value of £200. There are no limits to maximum win from the deposit bonus. Note that the free spins are only eligible to be used on the slots Gonzo’s Quest, Aloha, Starburst and Red Riding Hood. The free spins are given out for 10 days continuously by 30 spins daily. They expire within 24 hours so use them all up. The game weightings for the wagering requirements is an important factor so let’s take a look at that. The video slots make up for 100% contribution. For games in the classic slots category, it is 75%. For selected video slots games, it will count 20%. For all table games and Blackjack, it is 10%. Surprisingly, Sloty Casino site counts even the live casino section as per the wagering requirement, which is something quite unique. Most online casino sites don’t count this section. The live casino games will contribute to 10%. And all the video poker games will count for 5%. Note that to know the selected games, it is better to read through the Sloty Casino’s terms and conditions. Unfortunately, residents of certain countries can’t avail this welcome bonus offer. Such countries include Thailand, Philippines, Indonesia, Malaysia, China, Bangladesh, Mongolia, Nigeria, Poland, Croatia, Latvia, Greece, Ukraine and some others. Read through the terms and conditions to find out if your country of residence is eligible for the welcome bonus or not. Also, the deposits made through Skrill or Neteller accounts are not eligible for this welcome bonus offer either. Other than the welcome bonus, Sloty Casino site has some ongoing promotional offers for their existing customers. They are given out either weekly, monthly or daily and most of the times give out free spins, reload bonuses, and match up etc. as rewards. The first one is called the Happy Hour offer. This takes place on the daily from 8:00-9:00 AM and 8:00-9:00 PM GMT on the site. To be eligible for this offer, a player needs to make a deposit of at least £20 and spend it on any slot game during the promotional period. Once you are eligible for the Happy Hour, you can win free spins from the offer. On the following day, you will get 10 free spins on your account at 12 PM GMT. Another promotional offer ongoing at the Sloty Casino site is the Air Mail offer. This is for those who set the Sloty Casino site’s email address as a safe address. They will send out promotional offers to your email address from time to time. Just by getting signed up to the email, you can win some bonuses. The bonuses include deposit bonuses, free spins, exclusive promotions and cash drops. The best thing about these promotional offers, even though they might seem small, is that there are no wagering requirements attached. Whatever you win is yours to keep, no matter what your winnings are. As for the VIP program at the site, Sloty Casino’s standing seems to be very hazy. They don’t have any system to accumulate comp points, but they do boast about a VIP program. It is unclear what needs to be done to achieve that VIP status. They do claim to give out many exclusive options of rewards for the VIP users, such as bonuses, free spins, and promotions only reserved for the VIPs. They also claim to send their VIP users to holidays all around the world and birthday gifts on their birthdays. Other benefits include your very own account managers for personal transaction services, as well as VIP only invitations to promotions and events by Sloty Casino site. But we have no clue as to what needs to be done to get all these perks. Sloty Casino site needs to come up with a detailed plan here to make players more eager and interested to reach that goal, instead of just listing down some impossible perks. Like most other popular online casinos out there, Sloty Casino site also has made access easy for their mobile users. The Sloty Casino site doesn’t offer any dedicated app for their users as of now. The mobile version of the Sloty Casino site is easily accessible through any mobile or smartphone devices. All you need is a flash or java update to open the site on any browser and you are good to go. The mobile site seems responsive and runs smoothly. Some games from the desktop site are not converted to the mobile site, which is expected. But you can play around 500 games on mobile. There is a good selection of games there, we found them quite entertaining. Our experts fully recommend the mobile version, keep on reading our Sloty Casino review for more info! The overall site looks functional and usable on the mobile version. Other than playing games, making payments from your account or getting the promotional offers are also possible on the mobile site. You can also reach the customer support team via the mobile site. All in all, the site runs good enough on smartphone devices for you to take your games on the go. The live casino section of the Sloty Casino site has games from multiple providers like Evolution Gaming, NetEnt, and Play N’ GO. As you would expect from such big providers, the live casino section of the Sloty Casino is pretty rich. The live casino section includes all the classic table games, as well as a good range of their variants. You will also find a lot of games in dozens of tables to choose from. Some table games available at the live casino are French Roulette, European Roulette, Auto Roulette, Turkish Roulette, Dream Catcher, Caribbean Stud Poker, Blackjack Party, Speed Baccarat, Baccarat Squeeze and many others. All the games in the live casino are conducted by professional dealers from all over the world. The live casino section is truly one of a kind experience for any online casino sites, and Sloty Casino takes it one step further with its many variations. If you want to play at the live casino, make sure you have a good internet connection, as otherwise, you will lose out on getting that authentic feeling. 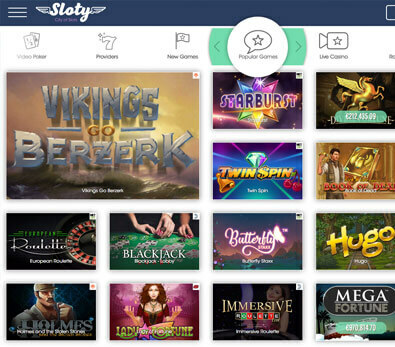 There are many banking methods available at the Sloty Casino site, to make the users feel comfortable to make their transactions with their account. The accepted currencies are USD, EUR, CAD, AUD, SEK and many others. Check out the site’s terms and conditions to learn more about this. The methods available to make your transactions at the Sloty Casino site are Entropay, EcoPayz, Visa, MasterCard, Trustly, Skrill, Neteller, Debit and credit cards and direct money transfer via bank. Each method has their positives and negatives but we will prefer the eWallets over others for their fast payout. Note that some methods are not available in every country so do your research. There are no fees required to make any deposits. The Slots Casino doesn’t charge anything for the withdrawals, but some payment methods might charge you small fees in exchange for their services. Read through the payment method’s terms and conditions thoroughly. The transaction period for making deposits is almost instant. They will transfer to your account as soon as you make the payment. The withdrawal period will vary depending on the methods, but the pending process is common for all the methods. The pending request will take up to 24 hours to process, and after that, the cash out will depend on the method. All the eWallets, other than Entropay will give out payment instantly. Entropay will take up to 3 days, same as Visa and MasterCard. Bank transfer will take the highest amount of time, which is anywhere from 3 to 5 business days. The maximum withdrawal amount for almost all the methods is £1,900 per transaction. The total withdrawal limit is £5,500 per week and £22,000 per month. The minimum deposit amount is £10 and the maximum is £5,000 per transaction. The customer support team is dedicated to solving any issue or question you throw at them, within a reasonable time. There is a question mark on the top-right of the site. When you click on it, you will find the way to access their help. There is also an FAQ section here, which has all the information or questions that might arise. If you can’t find your answer from here, you can reach out to the Sloty Casino stuff via live chat, phone or email. The live chat option is available around the clock, so no matter your problem, they are there to sort it out. If your problem is not urgent and you would rather talk in detail, you can send an email to [email protected] If you want to talk to someone, you can make a phone call via the UK free phone 08001700484 or the international number +356 27782286. No matter the way you choose to communicate, we have noticed that the customer support team at the Sloty Casino site is always friendly and eager to help out. The company started in 2017 under the Genesis Global Limited Casinos. The casino has licenses from the UK Gambling Commission, the Malta Gaming Authority and Curacao eGaming. The game list includes popular software suppliers like NetEnt, Microgaming, Evolution Gaming, Play N’ GO and many more. Getting the three licenses means any online casino site is safe and secure. The gaming authorities require the sites to maintain the standard procedures, without which the licenses are revoked. Given that Sloty Casino has all the licenses on the place, it is safe to say that the site is safe enough to keep your personal and banking data private. Moreover, the site has an SSL encryption. The site offers a fair chance to everyone thanks to their random number generator system in place. The results are completely up to the game so the chances of winning are the same for everyone. For responsible gambling, you can set limits on the number of deposits and time you spend on the Sloty site. You can also reach out for help and ask for temporary or permanent self-exclusion if you realize the risk. The Sloty casino site also has a page dedicated to the topic of identifying the gambling addiction signs. They also put links to gambling addiction assistance groups. The Sloty Casino site is a great place to be if you are looking for a variety of casino games. The games are unique and offer a range of old and new ones. Overall, the Sloty Casino is impressive in lining up some of the best games and promotional offers out there, that too in a short amount of time. Even though some of the countries are restricted, due to legal reasons, we can conclude from our Sloty Casino review, that this online casino is well rounded-up. It has plenty of options and offers infinite amount of fun. Whether you like to play slots or if you prefer to chat with a live dealer. This casino has it all for you. Don’t miss out!